What's your set up? How far? Jake? Hen? Both? I plan to use a jake and a hen...maybe 2 hens. Put them close since I'll be in a blind - maybe 10 yds. Another buddy says have them at 3-5 yds. But that's pretty dang close. I have a DSD jake and hen that I use. I will also use a strutting decoy. The quarter strut jake and hen combo has worked well for me. 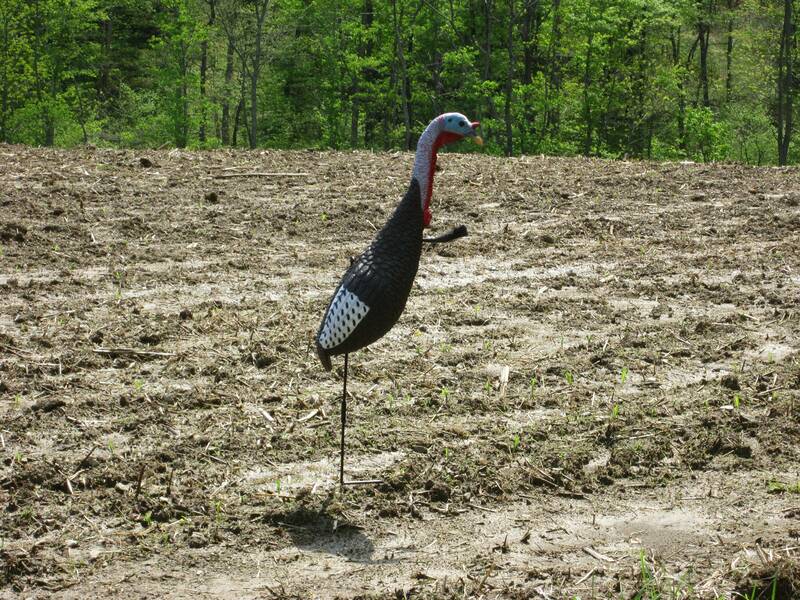 But last year at the end of the season I had a bird come in to my strutting decoy. But I would say I have had more luck with the jake and hen combination. I always put my decoys around 5 yards, but I also hunt out of a blind so I’m sure that makes a difference. If I’m carrying a decoy it’s a dsd too. They’re close to where I’m sitting but I don’t use em for draw power. I’m deaf in one ear and it gives me somewhere to look instead of trying like hell to locate em. The type decoys actually are determined by dif things. DSDs flat out look real enough to get ya killed so I’d not use a jake on public land. I too use the Dave Smith Decoys, mine are the 3/4 strutting jake and hen decoy. I set them up no more than 12 yards and facing me somewhat so the bird comes in and goes head on to the jake. I've used this both bow hunting and with children and it has worked well. It really allows for the bird to focus on the decoy and allows for minimal movement such as drawing a bow or situating a child/talking them through the shot. Our GA youth hunt is this weekend...cant wait! I use Flextone thunder turkey decoys, one feeder hen, one upright hen and one 1/4 strut jake. But I take away the jake decoy and add a full strutting Flextone creeper Tom after I see them starting to strutting. I place the jake or strutting Tom where I expect to shoot because gobblers always make a B-line for the competition. I try to face my strutter or jake in the direction of where I expect the gobblers to come from. I place my jake or strutter decoy between 8-10 yards from my blind. But when I'm on the move, I use 3 Redhead collapsible foam turkey decoys, one 1/4 strutting jake, feeder hen and a look back hen. I also use a pull up cord and tie off to the jake or strutting Tom to give them some movement. I use a Lynch Champion box call, Woodhaven slate call, and Clear Boggy Copper pot call. I use several different strikers. I use Feather Flex decoys as I 'Run-N-Bow' throughout the turkey season on several pieces of private property. The 2 hen and 1 jake decoys fold quickly (stake inside decoy) and fit into the back of my turkey vest. I decide which of the 3 decoys to use based on the number and mood of the birds and the set-up location. I hide in the weeds and woods of field edges, so distance to the jake is determined by where I'm able to hide in relation to the opening where I place the decoy(s). I try to keep shots under 15 yards as the tom kill zone is small and I'm usually not at my best shooting form in the Spring after a long Michigan winter. Come On May 7! Good Hunting to Y'all! Funky chicken looks goofy but something about it seems to really piss gobbler's off. I like to put 2 hens out with good visibility about 20 yards from the blind. We have had bad luck with jake and gobbler decoys scaring off the real gobblers so I don't use them anymore.